Where are the Men? Women have outnumbered men in church for decades now. In my home church, as a young man, the women outnumbered the men 3 to one. 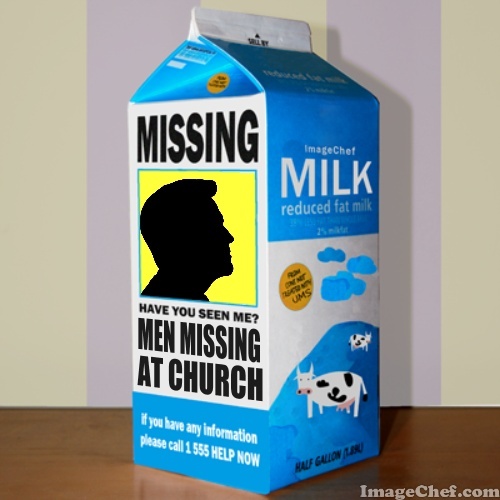 With each passing year, the absence of men at church has increased. Before I go further let me just list some facts to this articles assertion. · The typical U.S. Congregation draws an adult crowd that’s 61% female, 39% male. This gender gap shows up in all age categories. · On any given Sunday there are 13 million more adult women than men in America’s churches. · This Sunday almost 25 percent of married, churchgoing women will worship without their husbands. · Midweek activities often draw 70 to 80 percent female participants. · The majority of church employees are women (except for ordained clergy, who are overwhelmingly male). · Over 70 percent of the boys who are being raised in church will abandon it during their teens and twenties. Many of these boys will never return. · More than 90 percent of American men believe in God, and five out of six call themselves Christians. But only one out of six attend church on a given Sunday. The average man accepts the reality of Jesus Christ, but fails to see any value in going to church. · Churches overseas report gender gaps of up to 9 women for every adult man in attendance. · Christian universities are becoming convents. The typical Christian college in the U.S. enrolls almost 2 women for every 1 man. · Fewer than 10% of U.S. churches are able to establish or maintain a vibrant men’s ministry. At this point you may be asking; what can we do to change this? Before we look at what can be done to invite men and boys back to church, so to speak, let me say a few things. Let me start by saying, this is an issue I have grappled with my entire ministry life. I am engaged, interested and want to be a part of the solution and not a part of the problem. Having read, several books and periodicals on the issue some things surface that I believe need to be addressed. Some writers believe that church is more structured for women than men. They site men were created for adventure. They site that most service structures are about nurturing and safety which is more immediately comforting to women. Many of the writers agree that men are not being challenged in church today. I can understand some of these concerns and continue to address them to meet men and impact them when they come to our church gatherings. I firmly believe that men are key to church growth. Statistics bare it out, add 100 men to your church you will add 100 families to your church. When men are all in the family is all in. Talking with many pastors across the country on this issue has also caused me to evaluate: Church service structure, men’s groups, approaches and curriculum for boys and men. Just to repeat, this is not a recent problem it is (at least for me) a lifetime problem. Women have dominated the church make up from the time I was a baby in the 1960’s till this day. What are we missing? Is it our church services are geared more for women than men? Why don’t men and boys value church, spiritual growth, worshipping God as a high life priority? As a man, I am competitive and I take it as a daily challenge when I see women hungry for God, pursuing Him and learning more about Him daily. It is amazing to see the hunger of God in many women today and I am especially grateful to see that many are answering a full time call of God on their lives and entering the ministry. Where would the church be if it were not for faithful women answering the call of God to serve, minister and lead? Where could the church be if men would join the effort in huge numbers? Here is the bottom line. The church needs men! I need men to help with the work of ministry. We are overmatched and underpowered, in our efforts to share the gospel with our world. The church should be filled with men and women who are answering the mission call of God to reach our world for Him. How can we engage men where they are and get them involved in church? · PRAY: We always overestimate what we can accomplish in our own power, genius and creativity. We need God to awaken a sleeping giant…MEN. · MEN SERVING: To all the men who call GPC your home let me encourage you to serve here. Currently we have only one male teacher in our Grace Kids class. When men come to our church and see other men serving they know there will be a place for them in our church. · INVITE MEN: When we invite men and they show up it gives God an opportunity to work on their hearts through our service. Our church will never give up on men! If we are going to impact our cities and this world for Christ we need men to help us accomplish it. We are going to do everything we can to reach men where they are and get them engaged with the mission God has given us through Jesus. A special thank you to all the men of Grace Place who are already serving, setting great examples through your faithful attendance and sharing your faith with other men in your life.